It was with some trepidation that I took up the Black and White Photo 5 Day Challenge baton from Chilly Bella Photo Art. Chilly Bella Photo Art has been first class in producing a great image for each of the past five days and I hope that I can rise to the occasion. 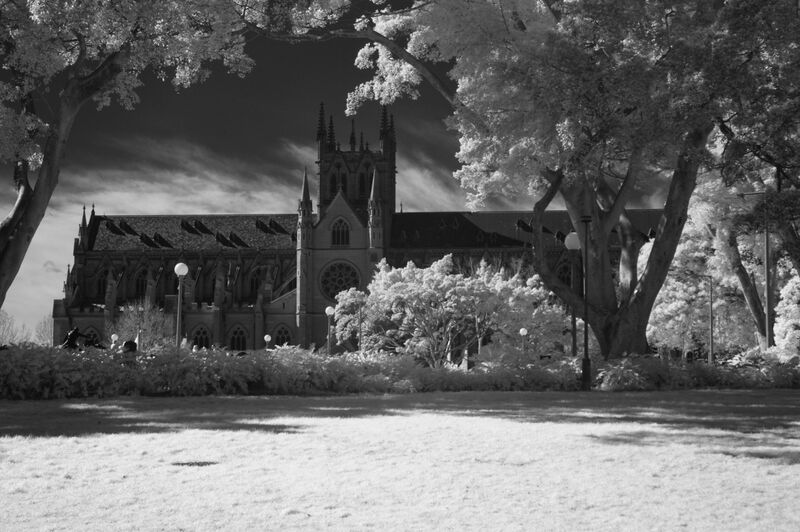 I’m a fan of infra red photography so for my Day 1 contribution here is my IR image of St Mary’s Cathedral, Sydney, the spiritual home of Catholics in our State of New South Wales. The image was made from Hyde Park which stretches for a number of city blocks and effectively screens the Cathedral from the city’s main hustle and bustle.I hope you like it the image..
ST MARY’S CATHEDRAL, SYDNEY, NSW, AUSTRALIA. For the technically minded, this image was made using my old Nikon D100 converted to capture only images within the infra red spectrum. At the time of the camera conversion, my Nikkor 18-70mm DX lens was recalibrate to ensure that both auto and manual focus remained accurate after the camera’s conversion. For this image, the lens was set at 44mm, aperture at f11 with shutter speed 1/80 second and ISO at 200, white balance on Auto. As you see the image it is as it came off the sensor with only a small contrast tweak in Silver Effex Pro 2. Please let me know if you would like my technical comments discontinued for the next four images. The conversions were made by Life Pixel of Mukileto, WA 98275, USA. I should point out that I’m only a satisfied customer and apart from that I’ve no connection whatsoever with Life Pixel. Cool BW picture! I like the scene. Really nice, it has a “Gothic” feel to it that punches out atmosphere! Personally I appreciate the technical stuff.